Nikolaos Cacos: President & CEO of Blue Sky Uranium Corp.
Blue Sky Uranium is managed by the Grosso Group. The Grosso Group is a management company with a 25-year uninterrupted track record of exploration and discovery in Argentina. Grosso Group is responsible for four world-class discoveries in Argentina. 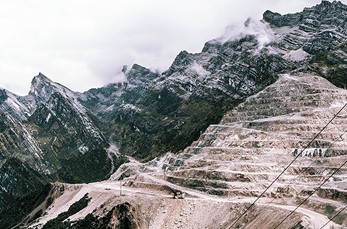 There's the Gualcamayo Mine, which is now owned and operated by Yamana, it was a Grosso Group discovery. The Navidad Silver deposit, which is the largest undeveloped silver deposit on the planet, now owned by Pan American Silver, and is being geared up to go into production - it was originally discovered by the Grosso Group. Chinchillas Silver deposit, which was advanced by the Grosso Group's Golden Arrow Resources, is being ramped up right now and joint ventured together with SSR Mining, an experienced precious metals miner. The Grosso Group's fourth discovery is the one that pertains to Blue Sky Uranium Corp., our Amarilla Grande project. We announced just a couple of months ago, over 19 million pounds of Uranium and what we expect has the potential to be one of the lowest cost Uranium mines to be put into production in Argentina. The Grosso Group is headed by Joe Grosso, an entrepreneur who is highly regarded and has been awarded and decorated in Argentina. Joe was named Mining Man of the Year and inducted into the Mining Hall of Fame in Argentina. The Grosso Group has an excellent reputation in Argentina for being respectful to the locals and being able to successfully take projects forward and to keep them on-track. From the social and community side to the financing side and management and administration, all of this is covered by the Grosso Group. On the technical side, we have two key people who are noteworthy. One is our VP of Exploration, Guillermo Pensado. Mr. Pensado is an Argentinean, Uranium expert. He's worked with many major mining companies, including Cameco, and he's been one of the key people behind developing the model for our Amarillo Grande project and our flagship Ivana property. The other key person is Mr. Jorge Berizzo. Mr. Berizzo worked for the Argentine Atomic Energy Commission, and he was one of their key exploration executives. He has been able to convince us of the potential for Uranium discovery in Argentina. Why is it worth investing in your property? The Amarillo Grande Project is a Uranium and Vanadium project. It is not a typical property, it is an entire district. It has a strike length of about 140 kilometers and is over 50 kilometers wide. We have seen Uranium and Vanadium occurrences throughout this entire district. Since Guillermo Pensado came to join us a couple of years ago, we've focused on only one small area of the property, the Ivana Target, which is at the southern portion. That's where we announced our first Uranium deposit and 43-101 resource of just over 19 million pounds. What we know is that the style of the geology has Uranium and Vanadium occurrences throughout the entire region, and we're looking at a potential to have host more than 50 or 100 million pounds. This is very similar to what they are finding in Kazakhstan at the Inkai deposit, which is one of the world's largest deposits, and one of the largest producers of Uranium. What's interesting about this deposit is not just the size, but also how low the cost could be, because the ground is unconsolidated. It's very gravel-like. We're undergoing a Preliminary Economic Assessment (PEA) study right now to demonstrate that this Uranium and Vanadium can be extracted economically. We predictAmarillo Grande has the potential to be one of the lowest cost productions in the world. Through our association with the Grosso Group, we've always had money and we're very cautious as to when we go to market to raise money. We raise money only for very focused and strategically value adding, exploration campaigns. So far, the company has been financed to get to the point of having a 43-101 resource calculation. Our next milestones are the completion of the PEA, the demonstration to the market that there are additional pounds of Uranium that can be added to our 43-101, and to identify the Vanadium potential since there are many targets that are primarily Vanadium. We keep our overhead costs very, very low. Our financials will show that we try to put more than 90% of the money that we raise into the ground. Right now, in terms of share structure, the company is about 75% or more held by insiders and our close associates and investment associates. What are the potential catalysts for Blue Sky? We expect to have the PEA some time in early fall, around September 2018. That's definitely a big catalyst. I think it will demonstrate to the market that not only does our deposit have the potential to be very big, but that it can also potentially be extremely cost efficient in terms of producing Uranium at a profit even in the current environment. Another catalyst is our ongoing drilling to demonstrate the expansion of the resources that we have identified. Over the coming weeks (Summer of 2018), investors will see the 19 million pounds beginning to grow over a larger region. The third catalyst, of course, is that we hope to have a report that highlights the economic potential of the Vanadium. We think there's a sizeable amount of Vanadium in our deposit and we're currently studying that. We've always known that Vanadium occurs in our projects, but it was more of an after thought, trading around four dollars a pound, approximately. However, over the last year, we've seen the price of Vanadium rise to 14, 15, and 16 dollars per pound. The reason for this is that Vanadium is like Lithium, it's a battery metal. We use Lithium in electric cars or mobile batteries because it's lightweight. Vanadium is a better store of energy and it's used in large storage sites as a key component in batteries. Vanadium is very much in demand. Primary Vanadium discoveries are rare and difficult to find. I think Blue Sky Uranium is very fortunate to have one right under our noses. What are the risks, moving forward? This is exploration, and the work that we're doing is to de-risk the project. We're taking the project right now from where we think there might be Uranium to where we know there is Uranium and Vanadium. We're starting to define a sizeable deposit that's getting into the world-class range. Political risks, again, are always there, but being in Argentina, we've seen a new pro-business government come in. I think that the environment for mining and doing business in Argentina has improved drastically in the last few years and there are a lot of analysts and articles that you could Google that will highlight that. The risks from locals and communities, we have, again, gone a long way to mitigate that. First, our projects located inside in southern Argentina are in a very sparsely populated area. In fact, the density of the population there is less than in parts of Siberia. As for people who live there, we take extreme care to ensure that we communicate with them what we do, what their fears might be, and we bring them along as partners. The people community there are is supportive of the work that we do. I guess the final risk would be the price of Uranium, and I think we've seen the bottom for the price of Uranium. The last couple of weeks, we've seen Uranium beginning to pick up. We're seeing a lot of stories about the demand for Uranium and new nuclear reactors. I think there are over 55 new nuclear reactors that are being built around the world. I think we're going to see better prices for Uranium. That being said, we believe in this project because we feel that it has the potential to be economic in this environment. A better Uranium price will only generate more profit for our shareholders. Oct 27, 2017 ... Connect to the most current information on stocks and bonds on Reuters.com for BSK.V. Looking to explore investment opportunities with BSK?